What’s on TV in Your Restaurant? Have you thought about broadcasting live events in the dining area and wrapping your messaging around live TV? This week we’ll tell you how to do it. Your dining customers are a captive audience. Think about how to make your dining area more welcoming and entertaining. We’re in a political year. You could broadcast the debates while offering debate night specials. This is an Olympic year. Draw customers inside and offer summer coolers during the events. Local content such as news, weather and sports is always an attractive pastime for dining areas, and consider the idea of creating branded and unique content for your own private television network. LG makes this application simple for quick service/fast casual restaurants and sports bars, with our affordable new LW540S SuperSign™ TVs. With their built-in TV tuner, SuperSign TVs enable users to have a simultaneous display of both live broadcast TV and advertising/promotional content on one screen. 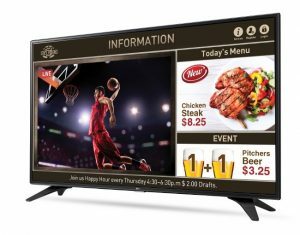 The SuperSign TVs are available in 43″, 49″ and 55″ class sizes—perfect dining areas and bars. With added features like digital media editing, error monitoring, scheduling, distribution and management capabilities, deploying this digital signage solution is a breeze. What’s more, SuperSign TVs are cost efficient because there’s no need to buy a media player. Signage content can be created using a PC and our free SuperSign Lite, SuperSign C and SuperSign Simple Editor software. The free software also facilitates revisions on the fly—just in time for daily lunch specials, new menu items, weekend promotions and anything else that comes to mind. Create your content using one of the 74 embedded templates. Add images and text to finish customization. Create a playlist—package the content and set content duration. Plug and play your content via USB flash drive or use the SuperSign network server for multiple TVs. Finally, SuperSign TV offers the option of remote management by remotely monitoring and controlling up to 50 SuperSign TVs with a PC connected to Internet. Keep your restaurant and sports bar customers entertained with live broadcasts, informed of your daily specials and enticed by mouthwatering images, all with LG SuperSign TV.